Immediately seek shelter in a substantial building and avoid the outdoors when thunderstorms are in the area. There is no place that is safe outside during a storm. Remain in the shelter at least 30 minutes after you hear the last sound of thunder. If you are caught outside and cannot find shelter, then go to a low-lying open place away from trees, poles, and metal objects. Ensure that the place you choose is not subject to flooding. Never touch any wires that fall or low-hanging wires, because they can kill. Telephone or cable TV wires that touch a power line can also be deadly. Never try to make your own electrical repairs to power equipment. Let trained professionals do the work. Never go into areas with debris or trees that fall. Dangerous power lines may be buried in wreckages. Never go near chain-linked fences. Dangerous lines could be touching the metal. Never step in puddles, because they may be electrified. Never connect portable generators to your household electrical wiring. Connect only essential appliances, such as freezers and refrigerators directly to a generator. Never walk into areas where professional Crews are working. Obey road signs and proceed cautiously if you are driving near work Crews. At SERVPRO® of Panthersville, our commitment to the community though our charitable donations is as important as providing emergency cleaning and restoration services for twenty four hours a day. We want to be judged not only by the service we provide, but also for what we do to improve the quality of life for all people in the places where we live, work, and nationwide. Our charitable donations include organizations that benefit Veterans, African Americans, Firefighters, and individuals who suffer from Autism, Alzheimer's, and Breast Cancer illnesses. The company's Management Team also participates in local walks in honor of Autism, Alzheimer's, and Breast Cancer patients, and we volunteer service with the American Red Cross for their Home Fire Campaign by installing smoke detectors in people's homes. By using a power cord in a moist environment is a serious hazardous defective condition! Swimming Pools—do not use electrical appliances near pools; do not route extension cords in the vicinity of pools; do not raise pool maintenance or rescue poles into overhead power lines. Outlets—look for outlets that have loose-fitting plugs, exposed wires, or broken plates and have them fixed by a qualified Electrician. Use safety covers on all outlets accessible to children. Surge Protectors—only use surge protectors with internal circuit breakers. To prevent overheating, these units will trip the breaker if the power strip is overloaded or shorted to prevent overheating. Do not plug a surge protector into an existing surge protector. Unplug the unit when the surge protector is not in use. Cords—do not place appliance cords where they will come into contact with the stove or other heated surfaces. Do not hang appliance cords over countertops where they might be accidentally pulled down. Frayed Appliance Cords—worn or frayed appliance cords can cause fire, electric shock, and even electrocution. As a basic home safety procedure, inspect cords regularly to assess wear and replace cords as required. Boats—keep boat masts away from power lines. Space Heaters—read all manufacturer instructions before use, and keep heaters away from furniture, curtains, sinks, tubs, and water. Do not lay rugs or carpet over the cord. Do not use heater if the cord is frayed or broken, and do not use an extension cord. Turn off heater before leaving home or going to bed. Ladders—exercise caution when using ladders, painting, pruning, or cleaning near a service drop where the wiring comes into a house or building at the meter. Weatherproofing on the overhead wiring is not insulation. This covering can become brittle, cracked, and expose you to electrical contact. Trees—do not climb trees near power lines. Keep balloons, kites, fishing lines, and aluminum poles away from overhead lines. The lines are uninsulated and you could create a path to the ground by touching them. Meter Boxes—ensure safe and easy access to your meter box; do not fence in meter boxes, use private locks on meter boxes, or surround meter boxes with trees and shrubs. Keep dogs safely secured away from your meter box. Shoes—avoid damp or wet areas when using electrical power tools outdoors. Wear sturdy, rubber-soled shoes when working with electrical appliances outdoors. 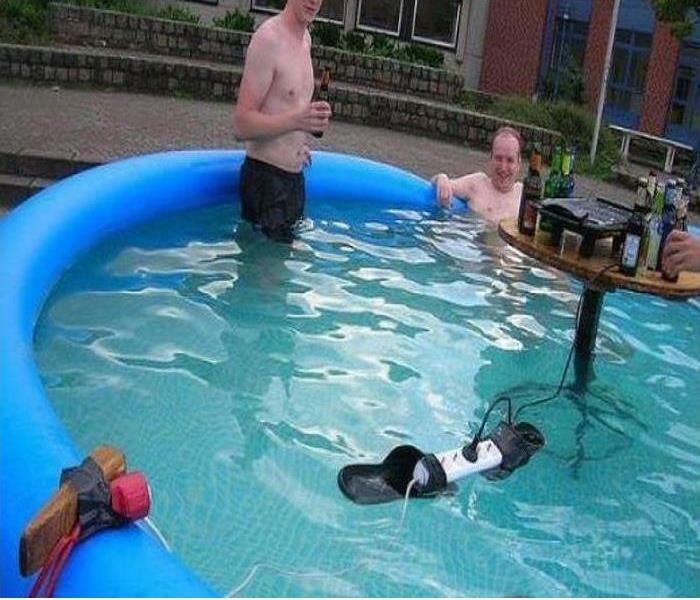 NEVER use electrical equipment when barefoot. Utility Poles—do not swing, climb, or run into guy wires supporting utility poles. Report damaged guy wires to the power company. 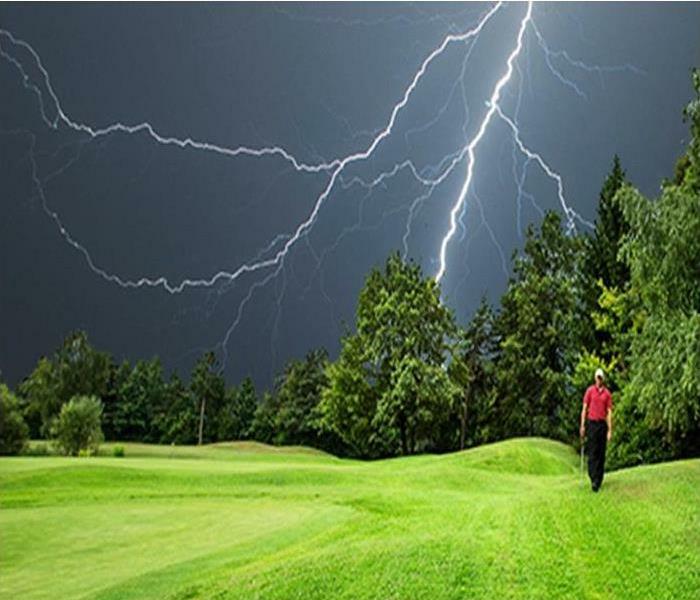 It’s hard to know what to do when you are caught out in the open during a lightning storm. To take shelter under a big tree? To stand out in the open? The best strategy is prevention. Monitor the weather forecast before going out, and look for darkening skies, lightning, or increasing wind. You are in danger if you can hear thunder. Therefore, find shelter in either a building or car. If you are in the open, then be a very small target! Squat low to the ground. Lying on the ground will actually make you a larger target. If you are in the woods, then take shelter under shorter trees or go to a low-lying, open place away from trees, poles, or metal objects. If you are boating or swimming, then get to shore and find shelter. 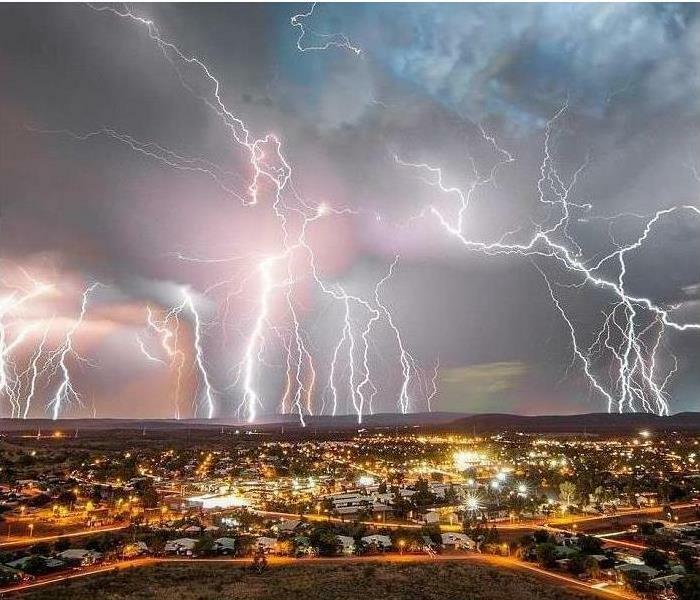 Call 911 if someone is struck by lightning. If the person’s breathing has stopped, then begin rescue breathing. A trained person should give CPR if the victim’s heart has stopped breathing. Contact our office at (678) 515-8602 for all fire remediation services. 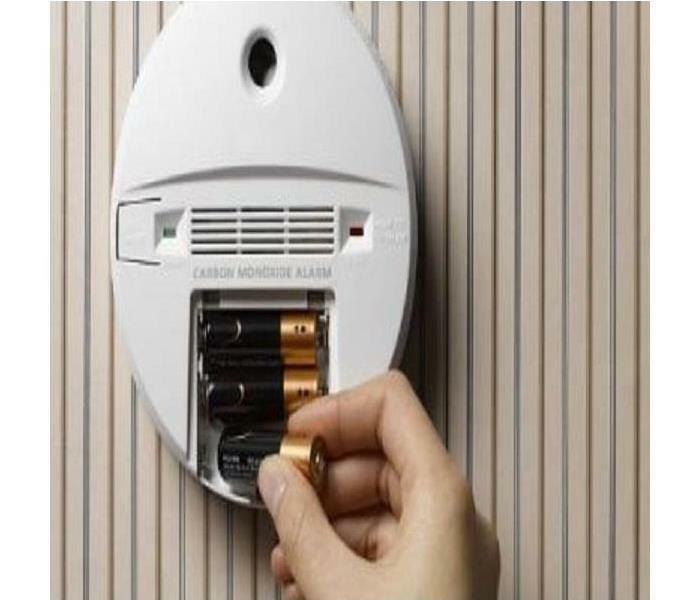 Summer cleaning around the house is a good time to change the batteries in your smoke alarms, especially if you forgot to change the batteries at daylight saving time. A smoke alarm is the first line of defense when it comes to surviving a home fire by giving added time to escape. You may have less than two minutes to escape a home fire. Every home should have working smoke alarms on each level, in the hallway outside the sleeping area, and in each of the bedrooms. Never ignore the noise of the smoke alarm. A constant loud “beeping” sound from the alarm indicates smoke or fire in the home. An intermittent “chirp” indicates the battery needs to be changed. Test the alarm monthly and replace all smoke alarms after ten years. Equally important, have an escape plan with two ways out and clear pathways to exits. SERVPRO® of Panthersville is available 24 hours daily to perform remediation services of your home fires. Give your home an electrical safety checkup! Summer is not only great for backyard barbecues, but it is the perfect time to finish some of those projects around your home that you have postponed all year. As you pull out the power tools and extension cords, chances are you won’t be thinking about the dangers of electricity. Never work with electric power tools in wet or damp conditions. Always look for nearby power lines before you begin to cut down any trees or trim any branches. 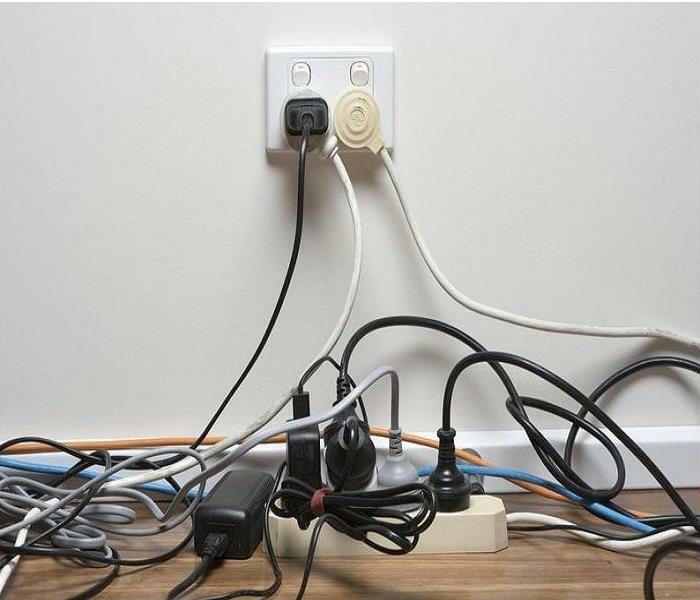 Ensure that extension cords are in good conditions and that they are not overloaded. They should be used only temporarily, and they should have safety closures to help protect children from electrical shock. Never run extension cords through walls, across doorways, or under rugs or furniture. Unplug electrical tools and disconnect spark-plug wires on gasoline powered tools before making adjustments or clearing jams. Check for loose fitting plugs that can overheat and lead to fire. Never remove the ground pin to make a three-prong plug fit into a two-conductor outlet, because it could lead to electrical shock. Also, never force a plug into an outlet if it does not fit. 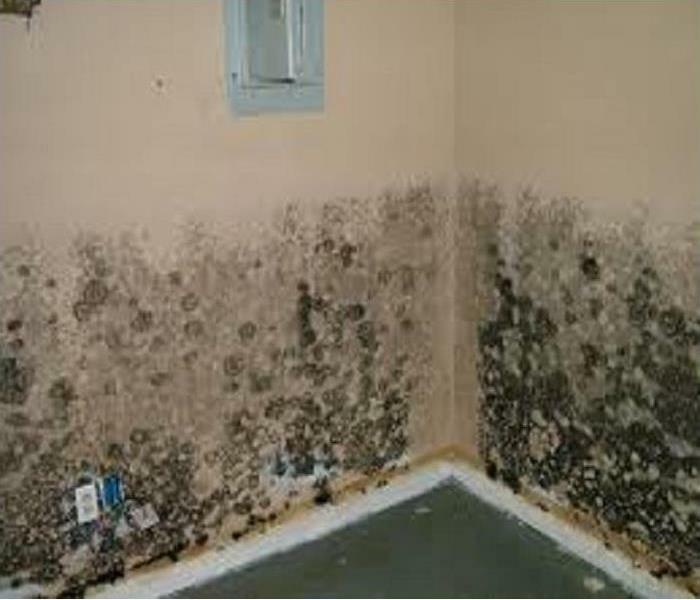 Contact SERVPRO® of Panthersville at (678) 515-8602 for professional mold remediation services. Identify areas where there is a moisture problem and correct it—basements and other areas that are prone to moist air can benefit immensely from the presence of a dehumidifier. For low-lying areas, sump pumps provide an additional line of protection by removing excess water automatically. Take note of any moisture you notice in your home. This can include dark spots on ceilings that indicate a leaky roof, or musty smells inside a closet. Fixing water leaks and replacing decaying wood can go a long way toward keeping your home free of unwanted fungi. Dry wet areas as soon as possible—if water gets into your home, remove it as soon as possible. For example, if you have water in your basement from a burst plumbing pipe or a heavy rainstorm, then dry out the area immediately before there is time for mold to take root. Even seemingly mundane things like leaving wet clothes in the washer for a few days can be an invitation for mold. Keep out moisture with proper ventilation—appliances that produce moisture, like clothes dryers and stoves, should vent outside. You should check your AC unit periodically to ensure that it is not generating moisture. If it is leaking, dripping, or the coils are covered in condensate, then you probably need to call an HVAC repair service. Use mold-resistant building materials whenever possible—this may be impossible in already existing homes, but if you are remodeling, building an addition, or building a custom home, then it is a good way to stay one step ahead of mold. There are newer varieties of drywall and Sheetrock that are paperless instead of gypsum covered with paper, they use fiberglass instead. This creates a highly water-resistant surface, and mold cannot break down and metabolize it. This is especially useful in bathrooms, kitchens, laundry rooms, and other areas where moisture is more likely to occur. Keep your indoor humidity between 30 and 60 percent. Consider using dehumidifiers if your home is humid, and you notice a lot of water condensing near windows and pipes. 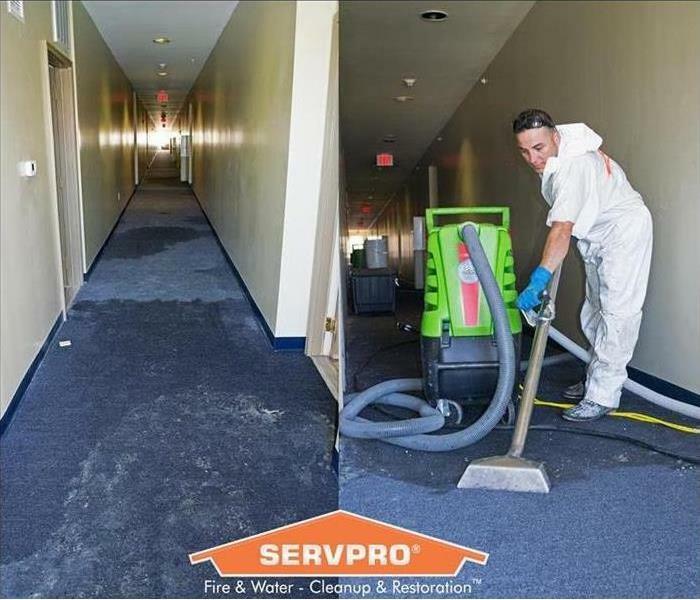 Contact SERVPRO® of Panthersville at (678) 515-8602 for professional water damage restoration services. Keeping your house safe from water damage is relatively easy. Review the following list of things you can do to keep your house free of water damage. Clean your gutters—ensure they are free from debris that can clog and cause water damage. Check your downspouts—your downspouts should be directed 5 to 10 feet away from the house. Slope your yard—keep water flowing away from your house, not into it. Ensuring that the landscaping flows water away from the house is essential. Check your sump pump—you want to ensure that it is working so, at minimum, test it at least once a year. Having a backup sump pump on standby (in case the first one fails) is advisable. Look for leaky pipes—make repairs before a small leak turns into a big one. Watch where you plant—some plants and trees have invasive root systems that will compromise your drainage system, water lines, septic tank, pipes, or foundations. Ceiling and attic check—ensure that you do not see any wet spots on the ceiling and attic above, because they will eventually spread below. Repair old, tired caulking—check doors and windows along with bathtub and sink fixtures to ensure that your caulking is not cracked. Water bill anomalies—double check your water bill. If it has skyrocketed for no apparent reason, then it may be due to a leak. Inspect the roof—look for missing or damaged shingles that can cause water to leak into your home. Use a drain snake, not chemicals—a clogged drain is a nuisance, but did you know chemical drain cleaners can eat away at your pipes? Try your luck with a drain snake first. Do not pour grease or fat down your sink—pour fat and grease into an empty can and throw it away. Your pipes will thank you. Inspect washing machine supply lines—check out the cold and hot water supply hoses and look for cracks and other wear and tear. It is recommended that you replace hoses every five years. Check the floor around your toilets, tubs, showers, and sinks—look for any soft spots or moisture. You might need a Plumber to fix any leaks. Check your hot water heater—schedule a plumbing inspection, look for signs of corrosion, and check your maintenance instructions. You may want to flush the tank every six months to remove sediment. Measure the humidity levels—do you regularly have condensation on your windows? The relative humidity in your home should range between 30 and 50 percent. A humidifier may correct sporadic humidity fluctuations, but ongoing high-humidity levels may be a sign of a more serious issue that could lead to mold and mildew that may require a professional. SERVPRO® of Panthersville have the expertise to provide a deeper clean than your basic house cleaning service. Call us at (678) 515-8602. 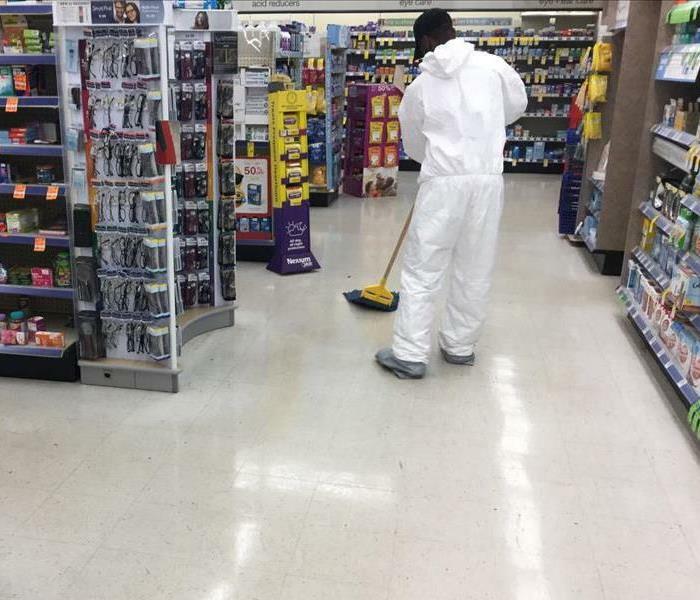 Always work carefully and do not hurry when cleaning up minor chemical spills. Keep people away from the spilled chemicals. Do not leave unless someone is there to warn of the danger. If the antimicrobial agent was spilled on anyone, then give correct first aid according to the label instructions. Use an absorbent material to soak up the spill. You can use soil, sawdust, cat litter, or diatomaceous earth. Shovel all contaminated materials into a leak-proof container for disposal. Dispose of it as you would do with excess antimicrobial agents in accordance with federal, state, and local codes. Do not hose down the area, because it will spread the chemical. Some spills can be neutralized to stop the chemical action. Read the labeling information to make sure that you use the correct neutralizing chemical, or call the manufacturer or distributor of the antimicrobial for assistance. Do not allow anyone to enter the affected area until the spill is all cleaned up. 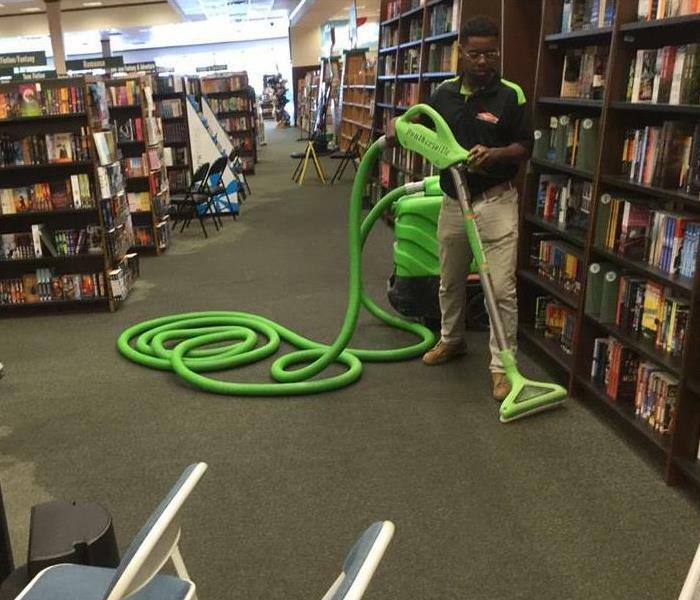 Do not hesitate to contact the trained professionals at SERVPRO® of Panthersville at (678) 515-8602 for your commercial cleaning needs. These machines use the advantage of heat and the force of high-pressure water to effectively dislodge and remove dirt and particulate accumulations on hard surface areas. The proper antimicrobial or disinfecting agent is proportioned into the cleaning steam to effectively reduce the bacteria count on the surfaces. Physical force of high pressure stream helps to remove contaminants so that the antimicrobial agent will be more effective. Large surfaces and irregular objects may be more easily cleaned and disinfected. The strength of the disinfectant solution may be easily varied by adjusting the individual machine’s injection rate. These machine are normally bulky and not easily transported. Auxiliary power source, such as gas, fuel oil, electricity, and so forth is necessary for machine operation. Worker requires training to successfully operate these machines.